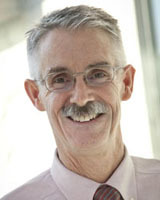 Stephen R. Carr, MD, is director of the Prenatal Diagnosis Center and maternal-fetal medicine diagnostic imaging at Women & Infants Hospital of Rhode Island, co-director of the Fetal Treatment Program of New England, and a professor of obstetrics and gynecology at The Warren Alpert Medical School of Brown University. His clinical interests include fetal sonography and invasive diagnostic and therapeutic techniques. His research interests include evaluation and management of twin-to-twin syndrome (TTTS). Carr is the State Air Surgeon in the Rhode Island Air National Guard. Francois I. Luks, MD, PhD, is director of the Fetal Treatment Program of New England, a pioneer in endoscopic fetal surgery, and an expert on TTTS and in-utero surgery. In June 2000, Luks and his colleagues at Hasbro Children’s Hospital and Women & Infants Hospital performed the first in-utero TTTS procedure in the Northeast. Luks was born in Antwerp, Belgium, and received his undergraduate degree and doctorate from the University of Antwerp. He was trained in general surgery in New York and in pediatric surgery in Montreal. He is currently a professor of surgery, pediatrics, and obstetrics and gynecology at Alpert Medical School. Sarah M. Davis, MD received her bachelor’s degree in biology from Eastern Mennonite University in Harrisonburg, VA, and her medical degree from Penn State College of Medicine. She completed her residency in obstetrics and gynecology at the University of Utah Health Care and fellowship in maternal-fetal medicine with the University of Vermont. From 2013 to 2015, Dr. Davis has served as assistant professor in the Division of Maternal-Fetal Medicine in the Department of Obstetrics and Gynecology at the Penn State Milton S. Hershey Medical Center. Dr. Davis is an assistant professor of Obstetrics and Gynecology (clinical) at The Warren Alpert Medical School of Brown University. Dr. Davis is board certified in obstetrics and gynecology nationwide and maternal-fetal medicine in Pennsylvania and Rhode Island. Her clinical and research interests include fetal sonography and maternal infectious complications of pregnancy. Matthew A. Esposito, MD, received his medical degree at the University of Rochester School of Medicine and Dentistry. He completed his residency in obstetrics and gynecology at the University of Maryland Hospital and fellowship in maternal-fetal medicine at Women & Infants Hospital/Brown University. Dr. Esposito is a clinical assistant professor of obstetrics and gynecology at The Warren Alpert Medical School of Brown University. Elizabeth J. Renaud, MD, is a surgeon at Rhode Island and The Miriam hospitals. She specializes in pediatric surgery and performs procedures at Hasbro Children’s Hospital. At Albany Medical Center, she was a pediatric trauma program director, associate professor of surgery and associate surgical residency program director. She held similar leadership positions at the University of Massachusetts Memorial Medical Center between 2009 and 2011. She was honored with the New York Rising Stars award in 2013. Dr. Renaud’s research interests include trauma, outcomes research, minimally invasive surgery, and adolescent bariatric surgery. Her work has been published in several peer-reviewed journals and book chapters, such as the Journal of Pediatric Surgery and the Journal of Trauma and Acute Care Surgery. She has presented her research on topics such as endometrial cancer, appendicitis and childhood obesity. She is a member of the American Society for Metabolic and Bariatric Surgery, the Pediatric Trauma Society and the American Pediatric Surgical Association. James F. Padbury, MD,is pediatrician-in-chief and chief of neonatal/perinatal medicine at Women & Infants Hospital, as well as the Oh–Zopfi Professor of Pediatrics and Perinatal Research at Alpert Medical School. Padbury has received numerous awards and grants, including a program project grant in perinatal biology, a grant from the Health Resources and Services Administration for construction of the Kilguss Research Institute in Providence, two Center of Biomedical Research Excellence (COBRE) awards for perinatal biology, and a shared equipment grant for an Illumina high throughput DNA sequencing platform for the Genomics Core. Debra Watson-Smith, RN is the nurse coordinator for the Fetal Treatment Program of New England. Watson-Smith is a graduate of the University of Rhode Island and the U.S. Army Reserve Nurse Corps. She has prior experience as an obstetrical nurse and is the research coordinator for the program’s clinical studies.